RE/MAX Select Professionals is proud to be a Miracle office with a donation being made to the Children’s Miracle Network Hospitals with every transaction we do! We hope you enjoy this inspiring story of a Mother’s Journey. In honor of Mother’s Day, one “Miracle Mom” shares her experience with Children’s Miracle Network Hospitals. It was June 23, 2013. After years of infertility, my husband and I were welcoming our triplets into this world. What should have been the most beautiful day of my life turned into a chaotic and bittersweet day as I delivered my babies more than 17 weeks premature. As I look back at this day, which is forever etched into my heart and memory, I can’t help but smile. My children wouldn’t have been given a chance at life if we weren’t at St. John’s Children’s Hospital in Springfield, Illinois, a Children’s Miracle Network Hospital. At this hospital, I celebrated the happiest day of my life, along with the two darkest days I’ve ever experienced. My children were born at 22 weeks 6 days, not even considered viable by most hospitals in our country. Yet the neonatologists were ready, in case my children showed signs of life. My daughter, Abigail, died a few hours after birth. Her brother, Parker, lived his entire 55 days in the neonatal intensive care unit (NICU). Our lone survivor, Peyton, is the definition of a Miracle Child. 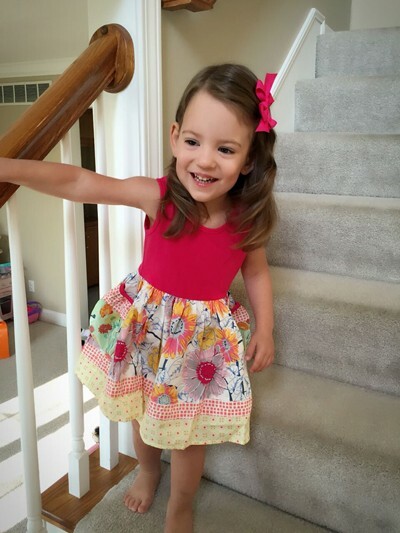 After spending nearly four months in the NICU, she’s alive and thriving at close to 3 years old. Born 17 weeks premature, Stacey’s daughter, Peyton, is the youngest baby to survive at St. John’s Children’s Hospital. The NICU can be a scary place. For some babies, it’s a brief stop on their way home. For others, like Peyton and Parker, it becomes their home. My husband and I spent every waking hour at St. John’s Children’s Hospital, oftentimes sitting bedside at our children’s isolettes, not able to even touch our babies because they were too weak. At just over a pound each, we never expected our babies to survive. But the doctors and nurses gave us hope every single day. And even as Parker died in our arms at nearly 2 months old, the staff provided us comfort. People often ask me how I return to a hospital where two of my children died. It’s easy — the hospital staff became family. Because of top-notch medical care, each of our triplets were born alive. And even though two of our babies lived just a short life, those few memories at the hospital will last us a lifetime. As a television news anchor, I’ve spent years volunteering for children’s organizations and interviewing families with unique stories. Never in a million years did I expect to someday become one of those families. But I feel so blessed to be part of the Children’s Miracle Network Hospitals family. You never understand the benefit of a CMN Hospital until you find yourself in need of one. For my family, we saw firsthand how donations to CMN Hospitals are being used. What may seem like a simple reclining chair is so much more to a NICU family. For us, that’s where we first held our 1-pound babies, giving us that moment where we finally felt like a family. After the NICU journey, our surviving triplet visited the follow-up clinic, where doctors checked her development. Those rooms funded by CMN Hospitals may look like a typical exam room, but for us it’s so much more. It’s symbolic of how far our Miracle Child has come. Today, our daughter Peyton is not only a survivor, she’s a walking miracle. As a “22-weeker,” she’s the youngest baby to survive at our hospital. As I watched Peyton recently dance at a CMN Hospitals event, I couldn’t help but tear up. She has defied the odds, conquering every uphill battle that has come her way. She’s not only beautiful and full of energy, she’s healthy. And it’s all because of St. John’s Children’s Hospital.